Leeds United edged a small step closer to their goal of making the EFL Championship play-offs, but were fortunate to pick up a point at home to Queens Park Rangers after failing to manage a single effort on target. In the end the goalless draw may prove a point gained with fellow top six sides Reading and Sheffield Wednesday losing so they actually improved their position. In-form Fulham’s victory at top of the table Newcastle keeps things interesting, however, in the play-offs race as they are now just six points behind Leeds with a game in hand to be played this week. For the visit of mid-table, but improving QPR, United boss Garry Monk was pleased to have top scorer Chris Wood back after injury up front and he recalled right-back Luke Ayling with Charlie Taylor missing out after his comeback in midweek. They started sluggishly and Rangers could have been ahead in the first 15 minutes. Former Leeds striker Matt Smith sent a header over and his strike partner, Conor Washington showed good skill and race to race clear only to be denied by home keeper Rob Green in a one-on-one. United started to show some nice touches, particularly from the recalled Ronaldo Vieira in midfield, but struggled to create clear chances. Alfonso Pedraza saw a cross-shot cleared and Kemar Roofe, playing on the right flank, had a shot blocked. Three successive corners saw the White threaten, but their opponents defended them well and the last of them saw the ball go wide off Pontus Jansson’s head. Smith went close with a flicked header from a long throw as QPR attacked again and their left wing-back, Jake Bidwell, got forward into space only to drag his shot wide from the edge of the box. The closest Leeds came was just before half-time when Roofe got in a powerful shot, but Rangers defender Nedum Onuoha did well to deflect it wide. 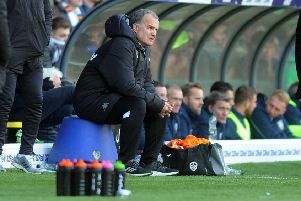 There was no improvement from the Whites after the break as they struggled to cope with their opponents’ 5-3-2 tactics. Green saved comfortably from Bidwell’s 25-yard effort and the other wing-back, Darnell Furlong, fired wide from distance as Rangers got on top for a spell. The hosts breathed a sigh of relief on 62 minutes as Washington cut in from the left and left Green rooted to the spot with a powerful shot, but the ball flashed inches wide. Leeds briefly responded as Wood did well to get his head onto a cross that was just behind him, but the ball went wide. Substitute Hadi Sacko livened up proceedings and got in a good cross only for Wood to mistime his jump and look to be pulled back by his shirt. No penalty came and the frustrations were growing. From that point Leeds huffed and puffed without getting any worthwhile efforts in and the game fizzled out to the disappointment of the big 30,000 plus crowd. Leeds head coach Monk was naturally disappointed with the stalemate and performance, but happy to have picked up a handy point in the circumstances. He said: “The positives are it’s a clean sheet and a point, but there’s no excuses, we didn’t do enough to win that game. “We were below our usual levels, which is unusual for us to say at home. It was not through lack of effort. “Even when we pushed in the last 20 minutes we huffing and puffing and still didn’t do enough to win. But it’s another point towards our goal. We are six games unbeaten and we will keep pushing. “The crowd were fantastic again. Everyone’s bought into what the players are trying to do. The fans push us and everyone realises what we need to do, we are in a fantastic position. Leeds: Green, Ayling, Bartley, Jansson, Berardi, Bridcutt, Vieira (O’Kane 78), Roofe (Sacko 59), Hernandez, Pedraza (Doukara 73), Wood. QPR: Smithies, Furlong, Onuoha, Hall, Lynch, Bidwell, Luongo, Freeman, Wszolek (Ngbakoto 79), Washington (Mackie 79), Smith (Sylla 78).